Media Displays‘ Ian Taylor tells us that UK public sector organisations are making the most of digital messaging vehicles to help raise public awareness during specific campaigns. One example they sent through was this very Heath Robinson looking digi-bike (shown above) that both the Leeds Teaching Hospital and Greater Manchester Police have used to take their campaigns on the move, reaching members of the public in city centre locations and also in the heart of their own communities. Leeds Teaching Hospitals NHS Trust recently created four hard-hitting videos as part of their Prevent Infection, Protect Everyone campaign to raise awareness amongst the public of healthcare associated infections. 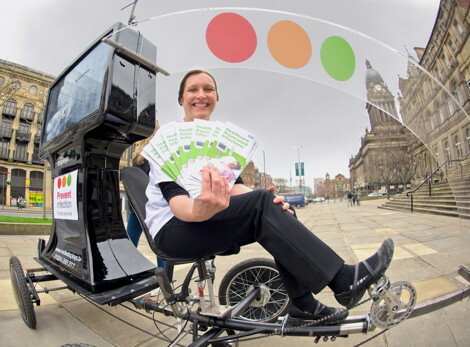 As well as hosting these videos online and encouraging people to circulate them, the team at the Trust hired an AV bike that showcased the videos with sound on dual screens throughout a pedestrianised area in Leeds city centre. The digi-bike allowed the team to get their message across to approximately 800 members of the public throughout the day in an effective and attention capturing way. Greater Manchester Police also used vans with large LED screens on either side as part of ‘Operation Spring Clean’, a campaign to keep communities safe by reducing crime during the spring holidays. The digi-vans were used to target specific areas across Manchester to raise awareness about criminals in the area who had absconded bail, naming and shaming them on the large mobile display screens.The digi-vans allowed the police to show photos of criminals who had absconded bail and also include information about them. This helped members of the public to recognise the wanted criminal and either alert the police to their whereabouts or encourage the criminal to turn themselves in. The campaign helped raise awareness in the community and encouraged people to contact the police with any relevant information they had. In total the Greater Manchester Police Force had six arrests with an additional offender handing himself in in case he was next to appear on the van. William Heath Robinson (31 May 1872 – 13 September 1944) was an English cartoonist and illustrator, best known for drawings of eccentric machines. This entry was posted on Tuesday, June 4th, 2013 at 00:30 @062 and is filed under DailyDOOH Update. You can follow any responses to this entry through the RSS 2.0 feed. You can leave a response, or trackback from your own site.